From vineyards in Paredones, just 8km from the Pacific, the DelViento (of the wind) range is names after the pronounced influence of the cold winds that blow in from the coast. 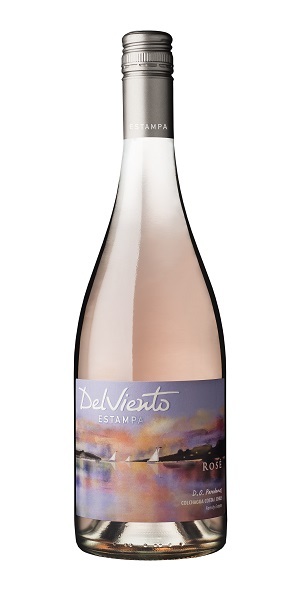 Estampa’s delicious and seductive DelViento Rosé is made in an absolutely delicate style that impresses with its mild fruity aromas. Fresh and fruity on the nose with delicate aromas of fresh cherries and cinnamon with light notes of citrus. Silky on the palate with refreshing persistence. Limited production wine – 270 cases produced. string(25) "Depth, vibrancy and value"
string(832) "Also known as Syrah, Shiraz was the variety which introduced the world to the concentrated and masculine wines of 1990s’ Australia. Here in the Barossa Valley, Langhorne Creek, Clare Valley and McLaren Vale it produces wines of great density and richness. In South Africa there tends to be more structure and freshness with earthy tannins. It is a variety which alters in the bottle very much as a result of the individual winemaker’s philosophy, as well as reflecting the unique terroir of the estates. Great with oak, it offers lavender, kirsch, black cherry and cured meat aromas and flavours. In its native Northern Rhône it is famous for the wines of Hermitage and Côte-Rôtie, whilst in the New World can lay claim to providing Australia with its two most famous wines; Henschke’s Hill of Grace and Penfold’s Grange."